I love to sew and I’ve been spending a bit of time in front of the sewing machine lately. Sadly and to be honest, “a lot of time” to me is really about 20 mins, so quick projects are what I need to feed this hobby! 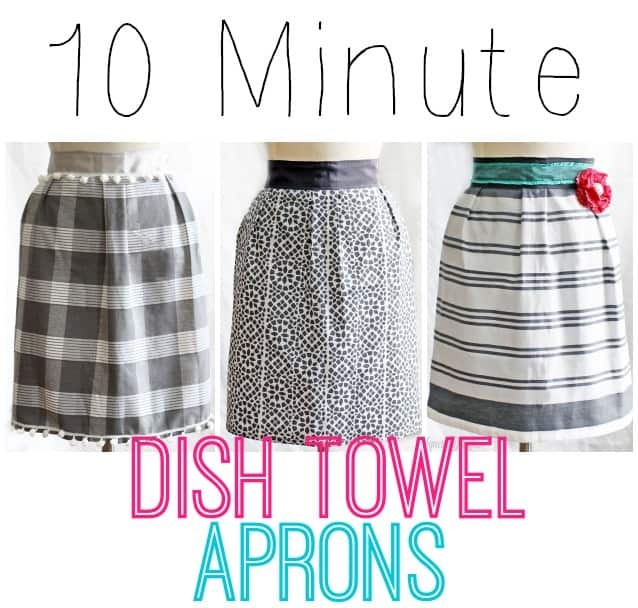 I wanted to share these dish towel aprons that will seriously only take 10 minutes to whip together! I timed myself making one and it was 7 mins, so I have faith you can do it in under 10 too! 85″ of Ribbon, (at least 1.5″ wide, the wider the better) I suggest 85″, but you can measure to suit your body size. May Arts has a great selection of grosgrain options. Fold the dish towel in half (widthwise). Pinch the fabric 1″ back from the centre fold you just created. Push your finger into the fold, making a ‘T’ shape. Pinch one side of the ‘T’ and bring the edge of dish towel back to meet it. Pin in place, repeat with the other side of the ‘T’. Fold the outside edge of the towel into the centre to meet the pleat you’ve just created. Repeat step 2-4. Repeat with opposite side of the towel. You should now have 3 pleats evenly spaced along the long edge of the dish towel to hold the pleats in place. Baste a straight line along the top edge of the tea towel. 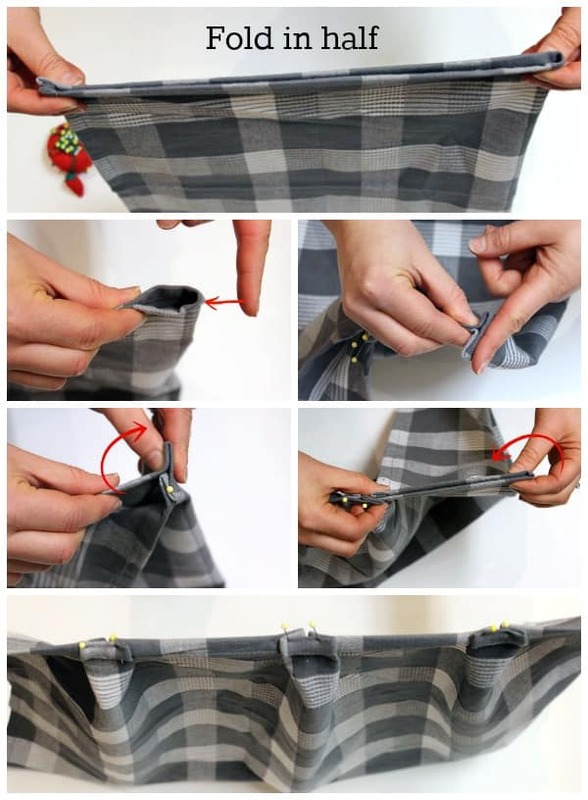 Fold the length of ribbon in half and line the centre up with the middle pleat. Pin in place covering up the pleats, to create a waistband. Using a straight stitch, sew around the parameter of the ribbon that is attached to the dish towel, creating a long rectangle of stitches. That’s it, how easy, right?! This one I added a fun little Pom Pom trim detail, cute, eh?! The third apron I added a bit more detail. A ruffled colourful ribbon, and a fabric flower. Still a simple dish towel apron, but a bit more flashy and fun! Can you believe how easy these dish towel aprons are? With a $7 pack of dish towels and only 30 mins (10 mins x 3 aprons) of time you’ll have 3 gifts perfect for a bridal shower, new neighbour, or the foodie on your list! I wear an apron every day so I think I’ll add these to my own stash. Are you an apron wearer? Full body or half, which do you prefer? love a These! What is the size of the dish towels? Hi Sylvia, I think they are just standard… 27″ x 21″ are what mine measure. Hope this helps, happy sewing! These are so so cute. What a great idea. I ADORE these! Pinning and going to make FOR SURE! Great for mother’s day too! Thanks Shauna! Mother’s Day is a great idea! What brand are these dish towels? I haven’t seen any this cute! Any tips on where to find cute ones like this? These dishtowels are “Everyday Essentials” from the Superstore (if you’re in Canada) I often see cute ones at Homesense or Tj Max or Marshalls in the US. Good luck, happy sewing! These are so adorable Virginia!! Pinned and making one of these days- thanks for the easy tutorial!! Are you kidding me!?! I’m crazy for these. I want to wear them as normal clothes they are so adorable. Please please stop by and share at our link party! These are just adorable! They would look just lovely hanging, one for every day of the week… all hanging in my pantry! oooh, thats a great idea Laurie! These are darling, love them!! What a cool idea! And your instructions seem very easy to follow! Thanks for sharing. 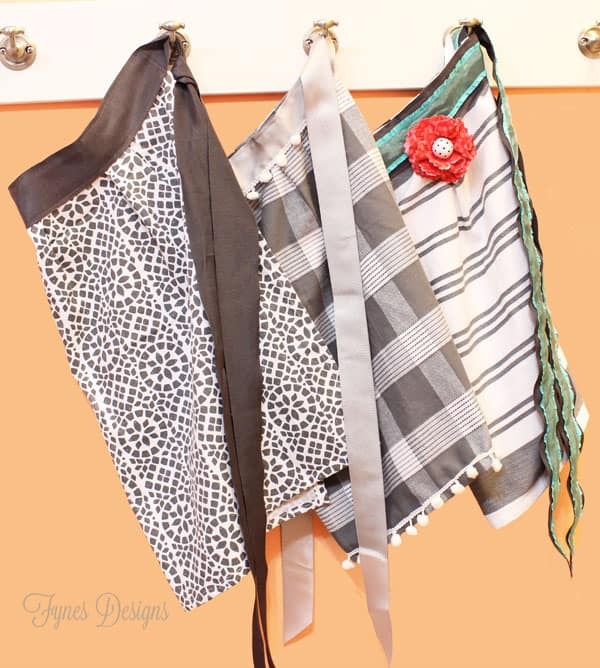 These aprons are seriously the best! 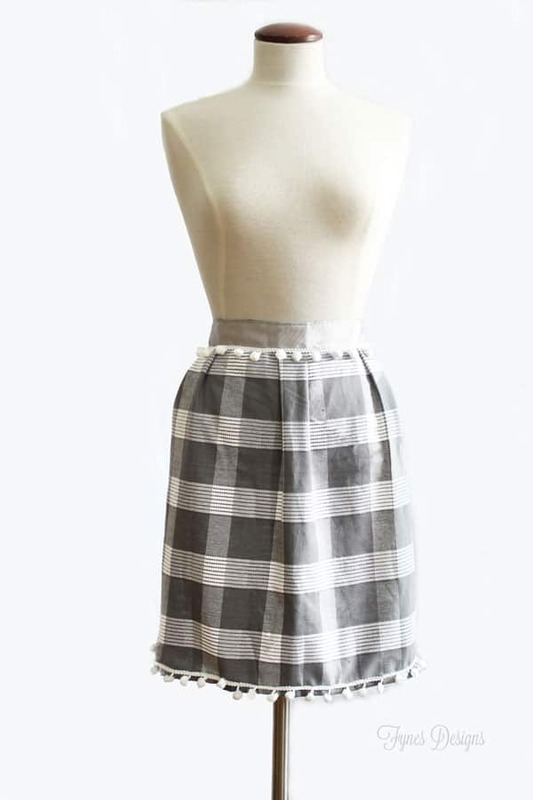 I have a major apron addiction and I can very well see myself making these with cute towels! LOVE them! I’d love it if you would share this tutorial sometime at my new Pinterest link-up hop! I adore these so much! I’ll be featuring them tomorrow at our link party. Be sure to stop by and grab a feature button! Hi, Virginia! Popping over from Link It or Lump It. I love these so much! I can’t wait to find the perfect dish towel to try it out:) thanks for sharing! Oh my gosh these are so adorable! Pinned! So cute, I’d need 2 dishtowels to make an apron for myself but I might understand how to pleast from your tutorial! These are way cute, Virginia! I can’t sew a lick, but will probably send my mom a link to this so she can get her crafty hands to work. Pinned instantly! I wear an apron when I remember, but most of the time it’s a full apron. Since I tend to lean against the counter tops when I’m stirring and baking I usually get my shirt dirty if I only use my half-apron, though I do like it because that one has pockets. Thanks for stopping by. I like an apron with a pocket too, but for simplicity sake I kept these ones simple. 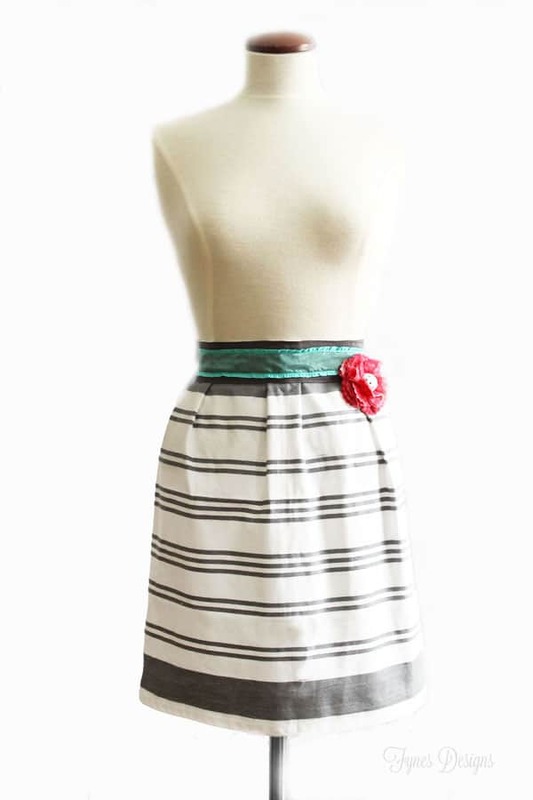 I bet you could use half of a second towel to tack on as a top for your apron and just use extra ribbon for the top tie. IKEA sells ADORABLE dish towels!! Full body, it is usually my shirt that gets splattered when cooking and baking. But I hate the aprons that have a single loop around the neck, which gives me a headache. I like shoulder straps. 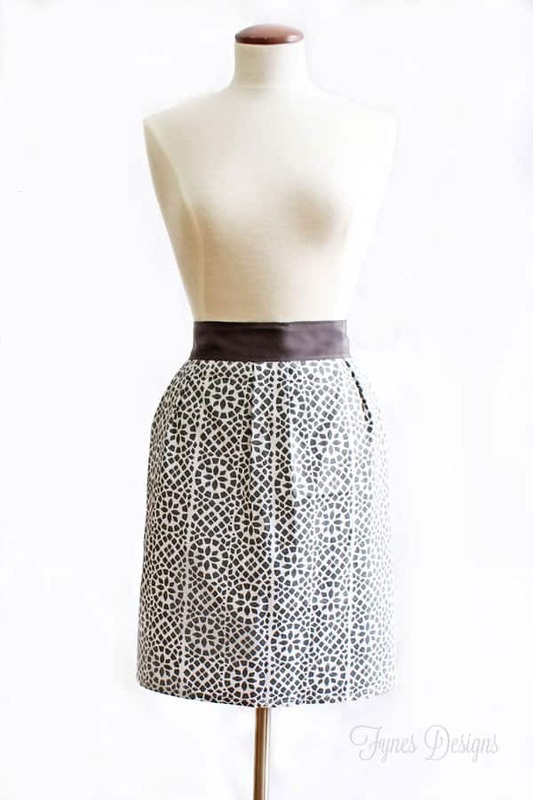 A simple pattern for a shoulder strap full body apron would be incredible! I really should do a apron with shoulder straps, my neck get so sore too. Put thinking cap on now! I love a simple sewing project. Rainy days are my favorite time to sew. This is great! These are adorable. I prefer the full apron and I like the neck strap. Mine is adjustable and does not cause any neck or head pain. I love to sew, and have very little time. I need a cute apron.Great idea &going to make it now. These are so cute and what a great idea for a handmade gift! Pinning! This is so cute! I am definitely pinning this and making it, possibly today. 🙂 Thank you for the easy to follow plan! So glad you stopped by Melissa. Stop by my Facebook page to shop off your finished project, I’d love to see! I plan to make these for my 5 granddaughters for Christmas. Thats awesome! I’m so glad you can put this project to good use! Quick question, my mom’s been wanting a terry cloth apron. Is Terry cloth easy to work with? I honesty havn’et worked with it too much, but if you had a serger to fix the edges I can’t imagine it would be too hard. What do you do to finish the ends of the ribbon? I’m making one of these for my 8 yr old granddaughter for Christmas, to go with the Children’s Cookbook I’ve gotten her. Thank you for sharing! That will be a sweet gift Phyllis! Made these for Christmas gifts. Can’t get enough. Live this quick and cute idea! I’m going to use my vintage table cloth that is stained. I knew there was a reason I couldn’t let it go! Thanks for sharing. Your instructions were easy-to-follow. Very easy for someone with little sewing knowledge. 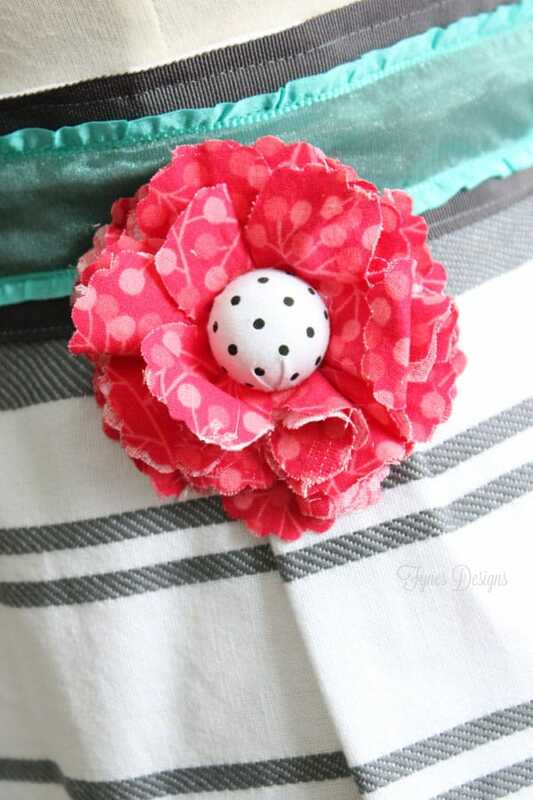 Saw this over at DIY Dreamer Top 30 sewing projects.. love it! Did u iron the pleats before you put on the ribbon? I probably did, because I love using the iron, but the pleats are basted so you don’t necessarily need to. Good luck, and thanks for visiting! I am so happy I ran across your page! As a 1st grade teacher I wear a half-apron EVERY day. Now I can make some new super cute ones! Thank you!!! So glad you like them, they are super easy to make! I would use a cordinating cotton fabric for the waist band. Cut or tear 2 strips 3 1/2″ wide by width of fabric…generally 44″…. sew the 2 pieces together…press seam and center on prepared .pleated towel. Sew right side of cotton to wrong side of towel. Then press under 1/2″ along cotton and then top stitch to front of towel along stitched seam…. thus waistband/tie. I love the use of buttons for decor so I’d probably sew a button on center seam to hide it…. that of course after I sewed a strip of ric/rac around center of belt/tie. … or a cute bow or flower would be adorable. For the ends of the ties I’d use an applique stitch sewn on an angle and trim raw edges close. For those wanting pockets you could use the fabric but possibly find matching dish washing little towels…like a regular wash cloth. They’d be fun folded over on one corner and make an angler pocket….again using a button to hold down that flap. (sewn by zig-zag or applique) Another idea would be using the cordinating cotton fabric and adding a ruffle along the bottom of the towel. 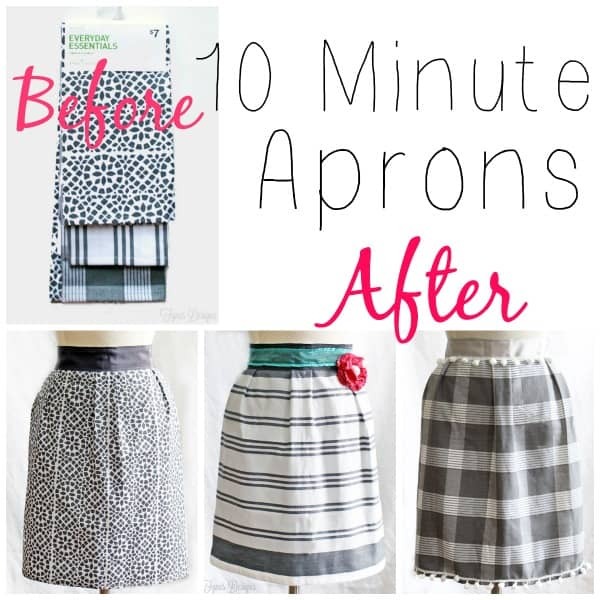 …..so there goes the 10 minute easy apron to at least up to 45 minutes but just imagine how unique it will look. Make sure you have your own personally made by Leslie Lewis label sewn on so your friends and family will always remember it was sewn by their special loved one. Have fun…. share your ideas I tend to over do my simple little project. 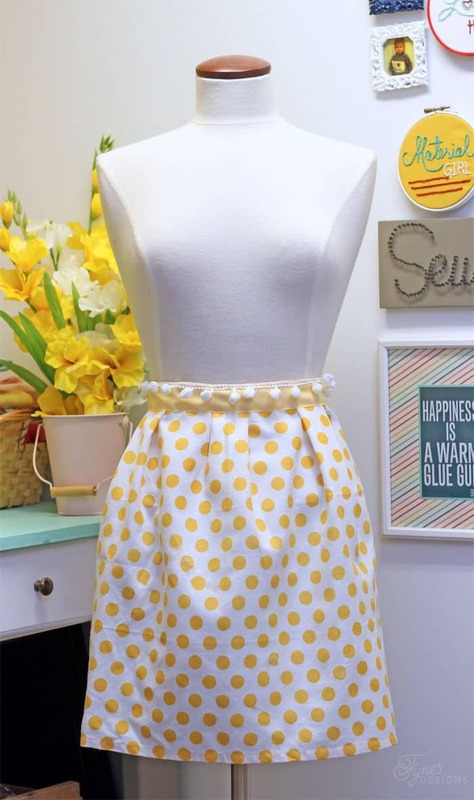 Love, love the apron pattern.. Have been going to figure this out for ages and just didn’t…. Thanks for figuring for me…. Will be making aprons for everyone for Christmas…. even the guys!!!!!! Sorry if I missed this in previous questions but do you use terry cloth towels or a cotton ‘tea towel’ type? I have solid color tea towels I embellish with machine embroidery and I was thinking these might make a cute apron. Thanks for a great idea! You can use whoever type you like!